Now that I have been here a full week — long for some, not long enough for others — I feel able at least to try to describe how different it feels, the high level political changes that have brought a wave of optimism (albeit still cautious) among people here. Travelling around Yangon I have the stranger's privilege, and patience, to talk to anyone who will talk to me. In the past this was not that many people, but on this trip I have not been able to stop people talking! In taxis, drivers talk in wide-eyed admiration about Aung San Suu Kyi — whose face can be seen everywhere on the front of newspapers and on posters and T-shirts — asking me if I have met her and what I think about her. At an evening meeting where a Karen academic (from a US University) gave a paper of her research findings on coping strategies of the poor, I met members of two Burmese CBOs working on 'human rights' who asked me if I could help them get books and publications from Thai groups about human rights and development. That really threw me. In a public meeting, to have Burmese in Yangon to ask me about human rights was just incredible! Probably most astonishing of all though is the press freedom. Internet sites are no longer blocked and reading Burmese language newspapers here now is not unlike reading the pamphlets and newsletters that used to be produced by Burmese exiles on the Thai border in the early 1990s — full of opinion pieces about politics, local and international. While all papers carry some coverage of economic summits, the trips to China by government officials and internal economic developments that fill the government-controlled press, independent newspapers carry these stories with a critical eye. There is especially a growing environmental awareness, partly spurred on by the alarm at the changes in the weather and the impact rising river temperatures is having on fisheries. Newspapers are a critical part of developing civil society, providing the information necessary for public debates on critical issues that need to be brought into the open. It seems there is a very active debate taking place in these newspapers, open to everyone who have access to Burmese papers. But the sad truth is that is not many people in the country. Aside from the fact that the papers are not cheap (2000 Kyats), most of these papers are only available to the four million or so residents in Yangon and other major cities. 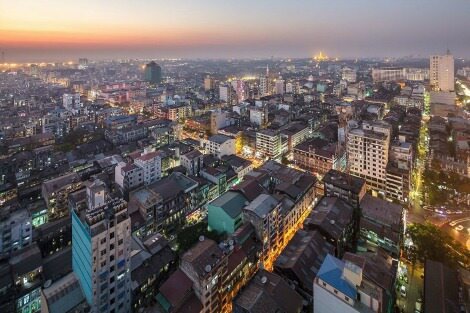 And it is when you begin to look beyond Yangon that you realise how people here live in a large bubble, largely insulated from what is happening around the country. While the political and economic changes emanating out of Naypyidaw have impacted Yangon, elsewhere there is, as yet, little positive change. While the national parliament (Pyithuw Hluttaw) sits daily, regional parliaments have only met twice, and some for less than a total of ten hours. The new constitution does not define the relationship between these regional meetings and the centre, and is rather a sketch of the structure of a political system, not its workings. In fact, the changes occurring now are driven not by those elected earlier this year, but by the de-robed generals. Most importantly, in ethnic minority areas, a lasting political settlement which would bring peace, demilitarisation and ultimately development, remains elusive. Much has been reported on the plight of the Rohingya in Rakhine state in Myanmar's west, where violence has seen more than 400,000 Rohingya Muslims cross into Bangladesh. Elsewhere, although peace talks have recently been renewed, local villagers continue to suffer the effects of a four cuts strategy, and are targeted if they are suspected of helping ethnic armies. "Right now it feels like Myanmar is ripe for change." In the country's north, aid has been very slow to reach the 20,000 Kachin villagers living in former gambling dens and warehouses along the China border. INGOs working in country have been actively discouraged from trying to reach these populations, and only now are MSF and needs assessments being carried out in these areas. There are some 6000 Kachin internally displaced around Myitkyina and Baw maw and they have fared better, getting assistance from the UN and INGOs. The ongoing fighting means that on this trip, I will not been able to visit our partners' projects sites in Shan and Kachin states, as these heavily militarised areas are not accessible to foreigners. I have seen other projects sites and met with local partners. I have seen the effective networking taking place among CBOs concerned with different aspects of community development across the country, and small community groups have asked for the kinds of assistance only a group with our donor base can give: to help them improve their projects and grow their organisations so that they are able to work more effectively in their communities and build strong, sustainable organisations. Despite the increasing amounts of government and INGO aid coming into the country with a capacity building approach, Burmese groups here really appreciate the difference between what we try to do and how others work. Our staff here have shown by example how we work, and have set high standards. The health team are in great demand for the training they are able to give community groups, not just in medical protocols, but also in organisational development. Many of those I have met would like to build a relationship with CPI as they know we are interested in long term support, have a flexible approach and are keen to learn with them, respectful of their knowledge of their own communities' needs and ways of meeting those needs that do not undermine existing responses. In schools-based education, for example, our partners all take a long term view, and work in the schools, with teachers and with parents, to improve the education the children receive but at the same time to strengthen the community through the school. In Yangon, EduNet provide long term teacher training adapted to the needs of the school, as well as health education, medical check-ups using local Doctors and nurses for the children. They have also built toilets and provided water pumps and filters for schools that previously had to buy in drinking water, at great expense. But in addition to this direct work, there are also many indirect benefits, as the changes being made in school ripple out to the larger community. In one school where teachers have stopped using corporeal punishment on children, parent education by the teams has also led to a reduction in beatings at home, as reported by the children. Explaining to parents that physical punishment leaves not just physical but also mental scars, is an important step, but ultimately seeing that the children can be 'controlled' by the teachers without recourse to punishment, and then seeing how much happier the children are in their learning, is more effective. At the same time, EduNet has used its contacts with journalists to have them come to the schools and write articles about how the schools are changing. This in turn encourages other schools, and critically also helps to attract more local donors to fund the school on a long term basis. And so it goes round, the drop of water making ripples of effect into areas even EduNet could not have foreseen. And so, I have ended up coming back to the media and to the process of change. Some kinds of change, like that which is happening in Naypyidaw, are beyond our control and beyond our understanding (who could have known so many changes would happen so fast, and yet so many things not change?). But in fact we can engender change well beyond our intended targets. And right now in Myanmar, it feels like a time that is ripe for change. Peta Fresco has worked to promote human rights in Myanmar for three decades and currently works in Myanmar supporting local organisations. She is writing under a pseudonym. I knew not much about internal politics in Myanmar until reading this article. I knew about the history of military coups and the oppression of the people of Myanmar. The recent escalation of tensions and violence in relation to the Rohingya people has been widely disseminated in the Western press and it is to be hoped that a peaceful solution can be achieved in this long-standing wound. It's heartening to read of the hard work being undertaken in human rights in Myanmar, well done. Thank you, Peta, for the sort of insightful article you should read in the newspapers but usually don't. Burma/Myanmar has been a bit of a hermit kingdom under the generals of SLORC. How far democracy and ethnic inclusivity for all residents go is still an open question. This includes the actions and statements of Aung San Suu Kyi which are absolutely crucial to the country's future. Traditionally the non-Burmese areas such as the Shan states were very loosely controlled by the central government until the British takeover from Thibaw. The Burmese, or at least a very strong and powerful minority, have tended towards a form of racism and exclusivity. That sort of racism and exclusivity was also in place under the former government in Sri Lanka. Fortunately, the latter country has also had a tolerant past and the current government is implementing that tolerant policy. Sri Lanka is very different from Myanmar, although, as a state where Buddhism is the most numerous religion and where Buddhists, Hindus, Muslims and Christians coexist peacefully, it could be an Asian role model for Myanmar to follow.